As much as I like to savour a book, it’s wonderful, once in a while when you start something and the next time you look up the 300 pages have already been read. 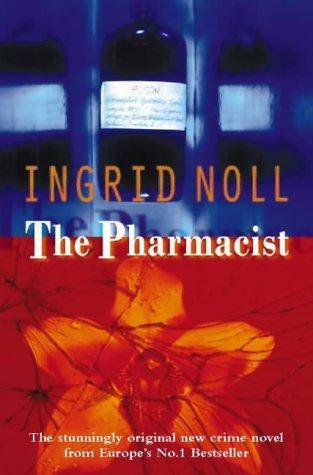 That’s pretty much what happened with The Pharmacist aka Die Apothekerin by Ingrid Noll. The book is currently only available in English as cheap used paperback or library copy. It has been made into a movie starring Katja Riemann and Jürgen Vogel. Noll is something like the grande dame of German crime that’s why it’s fitting to kick off the crime week of our German Literature Month with a review of one her books. 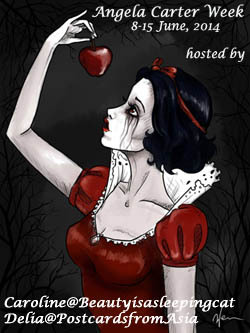 Not only does she write well, she is famous for her macabre ideas, black humour and psychologically complex characters. These are not whodunnits but explorations of the criminal mind with a twist. A little bit of Patricia Highsmith with a whole lot of very distinctly Ingrid Noll. The story starts bizarre enough with the narrator Hella Moormann lying in a hospital bed and starting to tell her whole life to a complete stranger, her bed neighbour, the elderly and seemingly inoffensive Rosemarie Hirte. Why Hella is in hospital is not told and it strikes us as uncanny that she would start to tell the most incredible details to someone she doesn’t know. Hella has two striking features. People constantly die around her and she always falls for the wrong man. Occasionally this is connected, sometimes it isn’t. She is a pharmacist and very well versed in potions and poisons. It seems that her latest lover was far more interested in this feature than in any other of her charms if there are any. Hella is a very unreliable narrator and distorts most things, we can only assume that she is far less attractive than she thinks. Levin, the young man she moves in with, is studying to become a dentist. His uncle is an extremely rich man and Levin is his only heir. He has a cunning plan involving false teeth and poison but he needs Hella’s assistance. Until the end of the book, we never really know whether Hell is as naive as she pretends. And while the story progresses we are more and more intrigued by Rosemarie who starts to get a bit too interested in Hella’s story. The only thing we know for sure is that people keep on dying. I really enjoyed following Hella’s tale, guided by Ingrid Noll’s acerbic wit and fascinated by the incredible pairing of striking descriptions with gross exaggerations. On top of all that this is a tale about fast cars, a big beautiful house, criminal people, accidents, pregnancies and a narrator who may or may not be innocent. This isn’t the first Ingrid Noll novel I’ve read. There was none that I didn’t like. 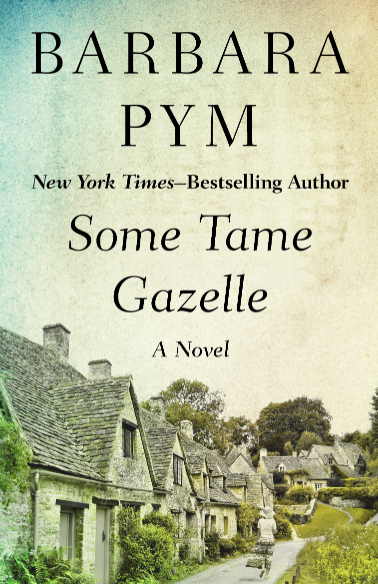 In Germany she is compared to Patricia Highsmith, Margaret Millar and Joan Aiken. In any case, Noll is for those who like their crime to be on the more literary side of the genre. Do you know Ingrid Noll? Do you have favourite German crime writers? I thought, this might appeal to you. She has written other books that I liked as much. In any case try one of the older ones.I read she had an occasional one off among her newer books. interesting. This Hella girl sounds like a fun character to explore. It’s a cretive way to write about a character, telling her own life to someone else. My read is supposed to be this week, right? I will read it after I finish the second story in Full Dark. If you want to be in line with us, it would be two weeks from now, during the classics week (week 4). That would be perfect but people pretty much follow any order they want. ah…then I will read it at the 4th week. Wonderful review, Caroline! I haven’t heard of Ingrid Noll before and from your description she looks like a fascinating writer. I haven’t read German crime fiction much and so this week would be a week of discovery for me. Thanks for this wonderful review. I will add Noll to my list of authors to be explored. Thanks, Vishy. I hope you will find her books. She writes incredibly well and the stories are quite dark but humorous. I’m almost tempted to read another one right now. Me too. It’s a great combination. I love a good crime novel, particularly in the winter months. This sounds wonderful – I will see if I can track down an old paperback. I saw quite a lot on amazon.co uk. Very cheap. I hope you will like her. If you don’t find this one you can try another one. She is a reliable author. That’s definitely something I’d like. Perhaps I can get a used copy. Typical. But Fitzek is available. Grrrr. In Germany they are re-published and re-published. I’ll review too other that are not bad later this week. Now I’m like Lizzy…. not telling. I think Danielle will also review one. I used to be a chemist so a book about a pharmacist appeals to me. I just hope that the science is accurate as it that tends to wind me up when they get it wrong. 😦 I love it when authors get it right though – I’ll keep an eye out for this one. Noting to worry, Jackie, there isn’t much science here. I hope it appeals anyway. It’s just an explantion why she knows about poison. I enjoy her dark humour. It’s quite mean. I’ve never heard of this author but she sounds right up my alley. Especially because of your comparison to Joan Aiken, who is one of my all time favorites. She isn’t all that well known outside of Germany but well worth reading. I haven’t read a lot of Joan Aiken but enjyoed what I read alot. I hope you will like Ingrid Noll. I have her “Head Count” to read after I finish The Murder Farm. I think I prefer the more psychological type of story when it comes to crime fiction/mysteries. I’m really looking forward to it and will have to add this one to my list as well. I think she is a wonderful writer. Headcount is one I have not read but it’s one that is said to be one of her best. I don’t think all of her books have been translated. It seems as if they were not fashionable in English anymore. In Germany she is still widely read. For me it lways a sign that something is on the literary side when the Swiss editor Diogenes has it in his programm. I think I could just read through their catalogue and be very happy. Our giveawy today is also a Diogenes in German.